This week started out on the warm side near 80F and varied between 75-82 during the week. This was also accompanied by several days of high winds and a few thunderstorms. 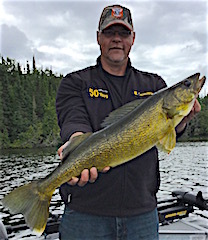 Guests managed these few days and enjoyed the wonderful fishing we have to offer at Fireside Lodge. Mike & Jennie Heinl from Pittsburgh, PA returned for their 4th consecutive year. DOA they caught some very nice Northern Pike with Jennie having the hot hand. 1st day they caught over 25 Northern Pike & Mike caught several big Smallmouth Bass. 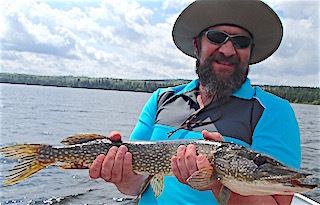 2nd day they had a super day Northern Pike Fishing catching 50+, 10 over 30” and Mike caught a huge 41” Trophy. 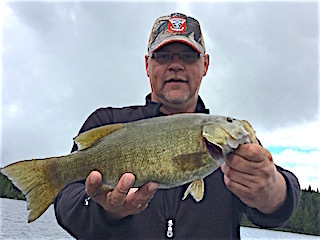 Also, Mike caught 5 large Smallmouth Bass. 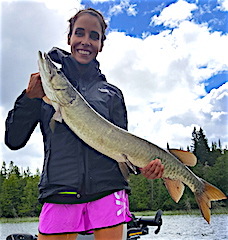 3rd day was all about Muskie and had Jennie catching two, one being in the high 30-inch range. 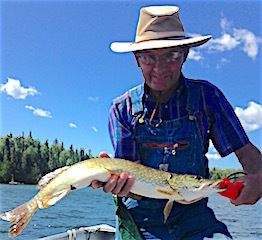 4th day was another great BIG Northern Pike day catching fishing in the 30-36-inch range. 5th day they focused on Muskie catching 2, largest being about 36-inches plus caught several nice pike. 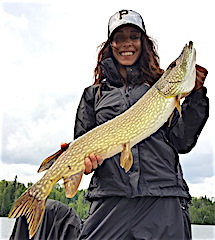 5th and 6th days were full of more large Northern Pike with Jennie catching two more Muskie & Mike landed a nice Tiger Muskie. 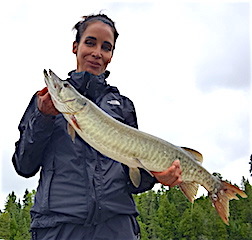 7th day was all about searching out Muskie and they did excellent meeting this challenge catching 5, yes 5 Muskie in one day plus a big pike. 8th & final day was a very good day fishing spending every last minute on the water catching more nice size Northern Pike. Both left expressing what a wonderful time they had and mentioned several times about next years trip. Returning for his 4th time was David Lilja from Woodbury, MN with good friend Don Heywood from Mound, MN for his 2nd trip. DOA they caught 7 Pike & a Smallie before supper. 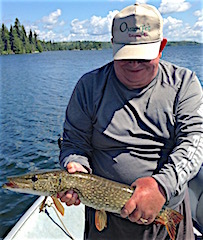 After a slow morning at 1:00 Dave said someone turned the Pike switch on having lots of action & landing 18. 2nd day was a repeat in timing as the fish again turned in the afternoon catching 27 Northern Pike. 3rd day was very windy catching 8 Pike and 3 Smallmouth. 4th and final day was better wind wise and fishing was good catching mostly Pike. Both thoroughly enjoyed their stay and the many conversations had with others in our dinning room. Good friends Steven Dentinger South Elgin, IL and Ralph Fruehauf, Tomball, TX returned for their 3rd consecutive year bringing Les Schalla from Salt Lake City, UT for his first visit. 1st day these three managed to catch over 60 Northern Pike. 2nd day was a good day fishing but a slower day catching however they still caught a dozen fish. 3rd day they did well catching a mix of fish and enjoyed the friendship & laughter that comes naturally among good friends. 4th & 5th day they caught Northern Pike experimenting with different techniques and locations. 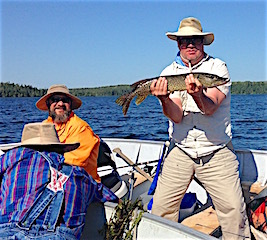 The 6th & final day they finished with a BANG catching close to 50 Northern Pike but a fishing trip, even though focused around catching fish, is much more for most and this group is a great example of the camaraderie and fellowship among friends and family that takes place. Father Tom Williams & sons Scott & Craig from Waterloo & South Point, OH with Tom’s sister Janet Kline & her husband Jerry from Ironton, OH were fishing at Fireside Lodge for their 1st time. 1st day was spent catching some Northern Pike and having a great lunchtime break at Twin Falls. 2nd day was their break out day catching about 25-30 Northern Pike per boat and had an absolute ball doing so. 3rd day was another good day fishing, even through the winds held them back a little; they still caught plenty of fish and enjoyed every minute of their day. This group knows how to have fun, not only fishing but engaging in great conversation and playing cards every evening, and there is no lack of laughter in this group. 4th and final day was great catching plenty of fish including Craig & Scott catching 5-6 in the 35-36” class. 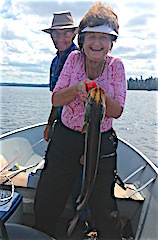 Tom caught his largest of the trip and sister Janet her smallest. These two made some special brother / sister memories along with Jerry and Tom’s two sons Craig & Scott. All said their trip was much more than expected and they will return. Father & Son Paul & Jeff Biernacki from Joliet, IL were fishing at Fireside Lodge for their 1st time. 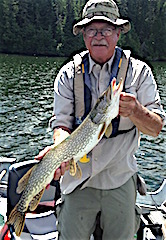 First timers & on their DOA they caught some nice size Northern Pike & Smallmouth up to 17.5” on surface poppers. 1st day was very good as they caught over 20 fish, mostly Northern Pike with a few Smallmouth mixed in. 2nd day was hampered by T-Storms but they still managed 19 Northern Pike plus a Smallie. 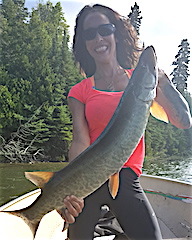 3rd day was similar to the 1st two except that Paul caught a Muskie. 4th day was very windy which contributed to a slower day catching. 5th & final day fishing they soaked up every minute of the wilderness atmosphere before having to head back to the busy suburbs of Chicago. They made another set of father & son fishing memories which is the biggest catch of all. Returning guests from the past, 1998, were Mark McGuire & John Latall from Naperville. IL & were glad t be back, and Mark brought his son Luke for his 1st experience. 1st day they went for numbers and they accomplished there goal catching so many Northern Pike they lost count, and Luke caught his fair share. 2nd day was searching for larger fish getting some follows, catching mid-size Northern Pike but the BIG Trophy eluded them. 3rd day was FABULOUS catching so many they lost complete count. Most were Northern Pike with a few Smallmouth plus Mark caught the Smallmouth Bass Hog of his life. 4th and final day had them having another good day catching Northern Pike with a few Smallmouth Bass. All left having fun and enjoying their stay. Consecutive year guests since 1994 Jerry Miller from Erwin, TN brought his son Jerry for his 3rd time & grandson Ezekiel for his first Canadian Fishing Experience. After their 1st full day fishing Jerry Sr commented at suppertime that he thought it was the single best day he ever had catching Big Smallmouth Bass. 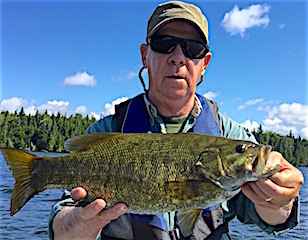 They caught 6 Smallmouth 18-18.5-inches and Jerry Sr & Zeke each caught 19-inchers. They also caught numerous 16 to 17.5 inches. 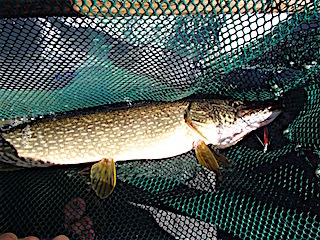 2nd day was just as good as they first for Smallmouth but they also caught 8-9 Northern Pike in the 28 to 34 inch range. By the end of day two between the 3 of them they caught 10 Smallmouth bass between 18-19.5 inches and Ezekiel caught 4 of these plus landed his first Northern Pike ever and saw a Moose which he thought was cool. 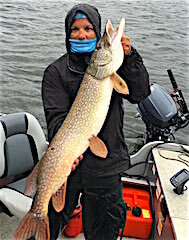 3rd & 4th days were full of catching many Smallmouth between 15-18” and 3 more trophies over 18 plus some very nice Pike 30-36-inches, Ezekiel caught a BIG 24-inch Walleye, his 1st ever, and Jerry Sr caught a huge 42-inch Muskie. Unfortunate no picture were taken as their camera got wet the day before and was not functioning. 5th & final half day they finished catching a lot of large Smallmouth Bass and Jerry Jr caught a HUMONGOUS 29.5-inch near 10lb Walleye. This fishing trip between Grandson, Grandpa, & Great Grandpa could not have possibly been scripted any better and the memories made are absolutely priceless. We thank them for choosing Fireside Lodge to make those special family memories. Bob Kopfer from Lake Zurich, IL was visiting for his second time bringing Jim Swett from Crystal Lake, IL. Bob is a remarkable man at 91 years old spend all day long in a boat fishing in sun, rain or wind, and walks up and down our hill to the dock better than some at age 50. He also still catches fish as him and Jim had 3 fun days Northern Pike fishing having their best day on the 3rd and final day. All guests marveled at and his abilities and gave us all hope that we may be fishing when we are 90 plus years old. Bob also writes self-published novels and gave us 4 editions, so when you visit us at Fireside Lodge you may want to look for Bob’s novel in our lodge. Father & Son Ed & Joe Evers from Cincinnati, OH were making their 1st appearance at Fireside Lodge. 1st day ever being on our lake system they did great catching both Northern Pike & Smallmouth Bass. 2nd day was a very good day for beginners learning new water catching numerous Northern Pike and some nice Smallmouth Bass. 3rd and final day (boy that went by fast) they did very well catching many Northern Pike and Smallmouth Bass and in the three days of fishing made a lot of progress learning the lake, fishing locations, and techniques that were working. The only goal not accomplished was Joe catching a Muskie. What they did accomplish is making some great memories between father & son and they can always look forward to a return trip for Joe to catch his 1st Muskie.